The Halloween season is full of tricks and treats but mostly treats for the majority of people. One way that you can show your love for the holiday while brightening someone's day is to make Halloween cookie bouquets. They are simple and easy to do, and you can use any design of cookie that you want depending on who is getting the bouquet, such as a young child or someone who is older. If you're making a bouquet for a child, then you want to include cookies that are fun and exciting. Use icing in bright colors and shapes that really depict the holiday. Examples include witches, pumpkins, and ghosts. A bouquet for someone who is older might not require as many details. 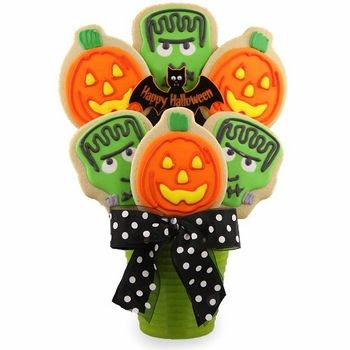 You also want to keep the cookie designs a bit tame, such as pumpkins, scarecrows and other fall shapes instead of the playful images that the younger generation thinks about with Halloween. When you make the bouquet, think about what you want the person to feel when seeing the cookies. This will help to determine the colors that you use and the shapes. Find a basket or a vase that you can position the sticks in once the cookies are in place. Decorate the container before adding the cookies so that it has a Halloween theme. You could use stickers, ribbons or flowers along the sides of the container. Instead of using small sticks, use larger sticks for your cookies so that they will hold up to the weight of the cookies and the icing on them. If you're going to make both large and small cookies, then cut the large sticks in half so that the cookies look like a bouquet when they are arranged. Bake the cookies with the stick in them so that the dough can adhere to the wood. Once your cookies are cooled, you can start decorating them. Use icing that will stay on the cookies, such as a thick icing that you might put on a cupcake. Don't use anything that has a thin consistency as it will slide off. Wrap the cookies in cellophane, and position the cookies in a block of foam that is covered in orange or black paper for Halloween. These are good tips on how to make Halloween cookies for both kid and adults. I may try to make my own Halloween flowers this year.